I’ve lost count of the number of times my kids have whined “Why can’t I have that?” or “Why can’t we buy this?” The irony of me humming Andrea True Connection’s seventies disco hit More, More, More is completely lost on them. The meaning of the short movie Ruby Who? is not. Australian film-makers Hailey Bartholomew and Natala Stuetz have tackled issues of being happy with your lot in just six minutes. Their short film Ruby Who? is about a little girl who discovers that having more and being like others doesn’t mean more fun. In fact, as we see Ruby magically get everything she wishes for we also begin to see that she is weighed down by all her ‘stuff’ and can’t just be herself. The short film comes with a set of guiding questions for parents. I generally find that asking questions about things children have watched or read is best done by stealth but in this instance I just ripped into the questions, teacher and student style. Although I found it somewhat alarming (but also quite telling) that my two older boys really wished they looked more like Justin Bieber, I dug a little further and discovered that one son’s interest in Bieber was less about the hair-do and more about the fact that he is a successful musician (my son plans to be an “electric guitar legend” when he grows up – direct quote!). There is no dialogue in this movie which is an important element in letting kids draw their own meaning. Instead, the story is told through the music and special mention must be made of the film’s terrific soundtrack, by Aaron Nebauer. Ruby Who? is an excellent starting point for a discussion with your children about body image and what makes us happy. Have it on hand for when these issues come up – they invariably will at some stage. 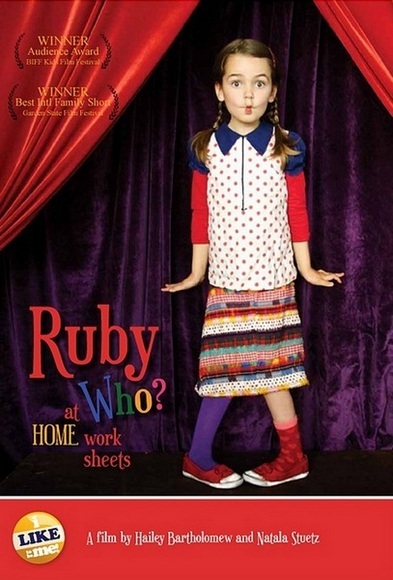 The Ruby Who? DVD is available from I Like to be Me! for $19.95 though I recommend the full kit for $35 which includes the DVD, teacher/ parent guides, colouring pages and more. Lastly, for those who need an earworm for the day, More, More, More can be heard here!